Most of the time, this story is told as a tragedy, but not here. Here, the lovers are not impatient and they are not desperate. The lovers, in fact, have faith. Together – regardless of what keeps them apart in other ways – they have faith in the love that they share. Individually, they have faith in the love that they hold within their separate selves, they are confident in the truth and even perhaps the Natural Law of this love. They don’t have to turn over tables or swim English Channels or overthrow the government or cause whole families to murder one another. Their ordeal is simple, though no less difficult and painful: they must remain true, at all times, to one another and to the love that exists in the atmosphere between them, never wavering, and they must be patient, and they must believe – and in doing so, they persevere. For what they have between them is true and is in accordance with Natural Law and the cosmos, and time will inevitably defeat any obstacle that stands between them. When they join, there is a sudden and overwhelming release of energy and joy into the entire world surrounding these two, like some kind of reverse hydrogen bomb explosion that blasts the earth and water and air with life instead of with death. 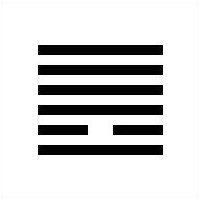 Within this sweet simple story is the entire essence of this hexagram. The hexagram is about people joining together. The text tells us to examine the nature of fire – the flames lick upwards toward heaven. In the same way, it is our nature to flicker toward one another until all our flames are but one great bonfire. Let’s come together. Let’s talk about this. 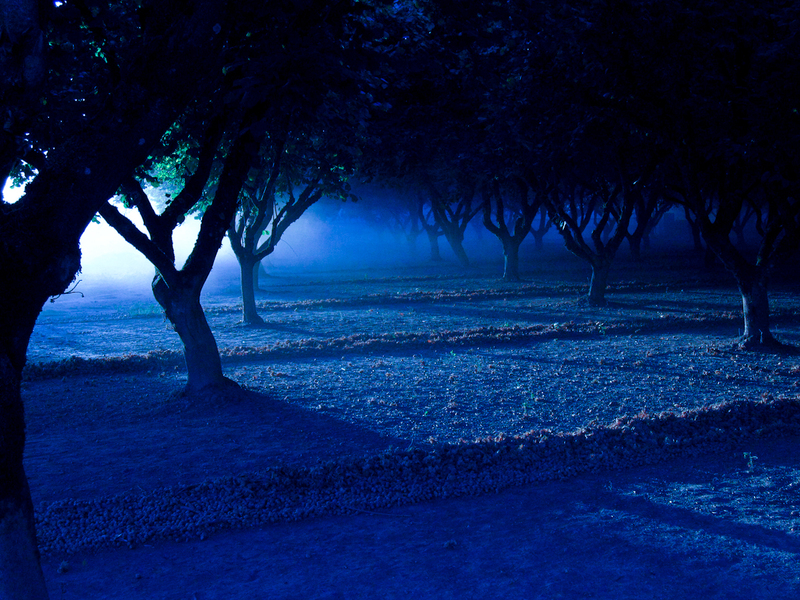 Night-time orchard of unity and solidarity. But it’s undeniable, at present, that we all are as cut off and isolated from one another as the lovers in the story, and the obstacles between us are called Legion. Without the distracting hormones of love that we find in our metaphor, however, our reality sometimes seems even more hopeless. Union seems impossibly far. Why bother even trying? 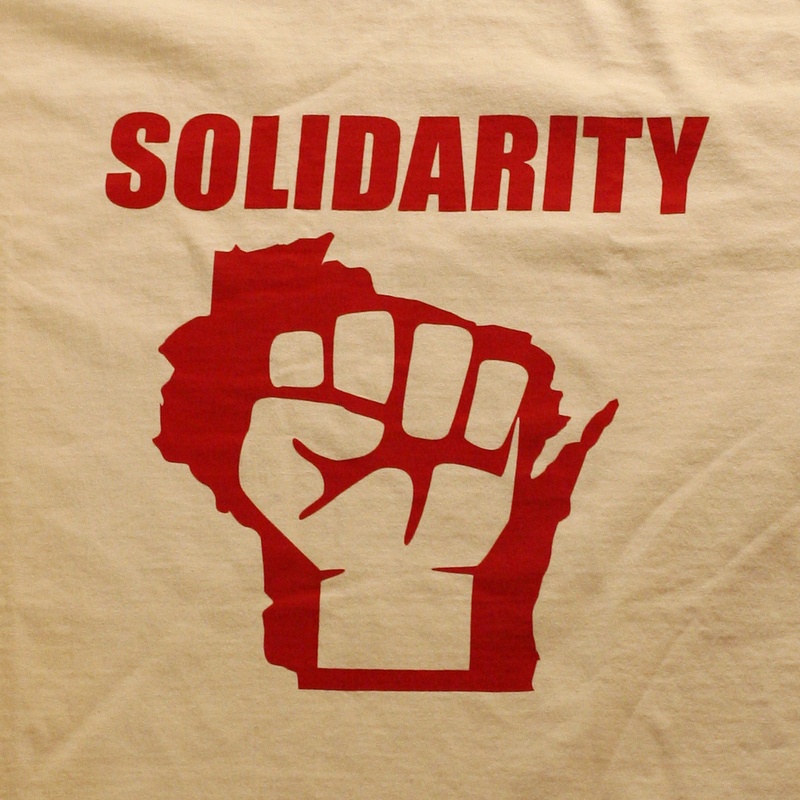 What we’re talking about here is a peaceful, voluntary society of solidarity with one another. The first requirement for this is that people are, in themselves, strong enough to be firm in nature, yet noble enough to subordinate one’s own petty and individual desires in order to remain faithful to the group. I’m not talking Utopian crap here, nor am I talking some kind of individual-erasing totalitarian communism. This just means that people are committed to getting along with one another and recognize themselves in everyone else and everyone else in themselves. It sounds impossible when presented with what we have before us each day, but very few things, if any, actually are. We have, as humans, universal concerns that apply to us all. It is upon these that a peaceful union of people is constructed. Private interests are what they are, but they do not contribute (despite what the Market Worshipers will tell you) to the better ends of humanity as a whole. The arrangements that come of “mutual self-interest” might seem natural and might even appear to function effectively, but they do not last. Like the couple whose love is true, when arrangements are made and organization is structured around the needs and care of all humanity, they last. Such a community in common requires all of us to do our part, to keep faithful and open, but the I Ching tells us that we still do require a leader around which to rally and who is capable of bringing this about. This is neither a tyrant nor a savior but a wise and benevolent figure who is clear in speech and intent and inspiring – not like Mussolini but like a gentle shepherd inspiring his flock to go to their favorite place, the place they want to go to anyway but might not have the perspective or wherewithal to find on their own. When people first begin to unite, the faithfulness that is required of us demands that everything take place in the open. Everyone must be up front with one another, in agreement and without any secrets or schemes. If, in the process of its gestation, the union of humans is diverted into the formation of factions, it’s over. It would be like one of our lovers deciding, after already waiting some substantial amount of time in isolation, screw it, and getting married to some other random person. It’s fatal to the cause. The opposite of faithfulness. There can’t be sides and parties in this game. It’s got to be everyone playing together. It gets a little bit harder, too, because we might – even in common – have a formidable enemy we can’t defeat right away. The enemy of the people. The enemy of union. But if I start trying to scheme ways to trick the enemy and take him by surprise, it is my own mind that is poisoned, and now I will see treachery and trickery everywhere I look. By my own craftiness, I will lose all trust in everyone around me. In a system of faith, a system of mutual commitment and, yes, trust, to lose this is to allow the entire apparatus to break down. Indeed, try to imagine not just me plotting and losing my clarity of mind, but multiple people doing it at once. Even if everyone starts off with good intentions, it’s going to end poorly. The other side is going to win and we’re going to remain apart. Eventually, we are told that we will recognize that fighting is not possible. Those we regard as “the enemy” will realize this, too. Walls will remain, but as tensions ease, we begin to normalize relations with one another, the first step in coming together in that universal sense that we’re going for. At first, the kind of peaceful, voluntary unity we are talking about will happen only in pockets, probably local ones. But find the pockets if they exist, and even if you exist outside of them, you can make alliances with them and further the creeping and inevitable spread of togetherness. We all love to see that couple, our lovers, get together at the end of the movie. We feel that love-bomb energy release out at us. And we’re assured here that, eventually, the lovers are going to get together. We are going to get together. It’s just a matter – through our own faithfulness and patience and proper behavior – of acting in such a way that we’re around to see it. But the most beautiful picture painted by this hexagram is not the sweetness of our archetypal love story but in the sweetness of a simple promise made to us by this tome of ancient Chinese wisdom: human society is not a jumbled and hopeless mass of chaos – not any more than the stars in the sky or the natural ecosystems of our planet. The heavens are aligned in an organized way and conform to a cosmic harmony. Nature’s cycles and balance is an extension of that. So are we. That’s the message, here. That’s the reason to have faith to begin with, never mind keep it all the way through to “the end”: not only can we unite together and flow in accordance with the rhythm of the universe itself, but this is our normal state of being. So let us stay faithful and committed and open with one another, and pray to the heavens that we return to this True Normal as soon as we possibly can.